u-blox has partnered with Huawei, Vivo, CAS Tecnologia and PinMyPet for conducting lab and field tests on new Narrowband IoT (NB-IoT or Cat NB1) networks in Brazil. The first tests are ongoing since Q1 2017 and initially focused on metering and tracking applications. These trials reflect u-blox's focus to meet pent-up demand for low power wide area (LPWA) connectivity, as delivered by NB-IoT technology, standardized by 3GPP in June 2016. The benefits of NB-IoT over other cellular radio technologies include lower device complexity, ultra-low power operation, and support for more than 50,000 devices per cellular cell. As it uses a licensed spectrum-based network, it also offers greater security and high robustness from interference. NB-IoT is therefore ideal for IoT and M2M applications requiring extremely low power consumption and better coverage even in shielded areas. Using the existing 2G network for the increasing number of IoT devices is not an efficient solution. NB-IoT is the natural evolutionary step for wireless operators, hardware manufacturers, and end customers. 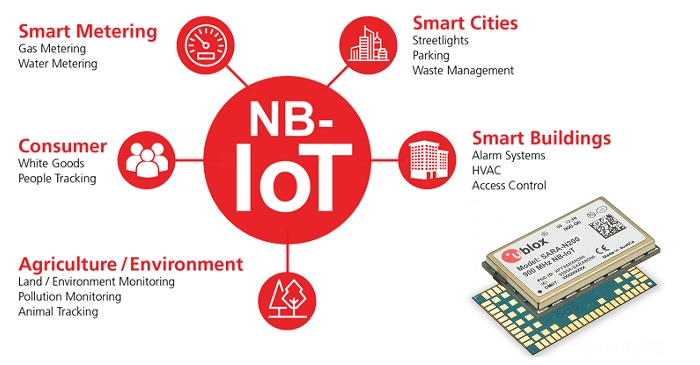 Embedded in the test device is the u-blox SARA-N2 NB-IoT module, the world's first cellular NB-IoT module compliant to the 3GPP Release 13, Narrowband IoT (LTE Cat NB1) standard. Designed for use in applications such as smart buildings and cities, utilities metering, white goods, asset tracking, and agricultural and environmental monitoring, the module will operate for 10+years from a single-cell primary battery. Its 16 mm x 26 mm LGA form factor, using u-blox nested architecture, facilitates simple upgrades from u-blox GSM, HSPA or CDMA modules and ensures future-proof, seamless mechanical scalability across technologies. The low power consumption of u-blox SARA-N2 and improved coverage of NB-IoT networks in Brazil is expected to bring important benefits to a lot of client solutions.